These are two of the marvelous sculptured heads that John L Stephens, F. Catherwood, and party found abandoned amid the jungle-conquered ruins in 1841. 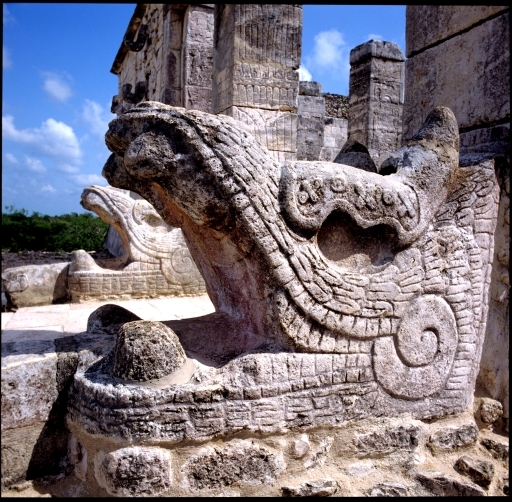 They protect the base of the north staircase of the El Castillo Pyramid. (Read about that amazing expedition in Stephen’s “Incidents of Travel in the Yucatan”, published originally in the 1840s, with really wonderful art by Catherwood.) I often think about the people who fashioned these beautiful and violent Mayan sculptures and structures. They sure left behind impressive art.